These are Replacement Spring Handles. They fit many stoves. They are Nickel Plated measuring 3 1/2" inches long and will fit a 5/16" to 1/2" Shaft. These are sold as singles, if you need a pair, please enter quantity of 2. For more information call us at 336-701-0555. Note**Shaft sizing on the spring handles vary. Some work may be required to get them to fit snuggly. You can reduce the size on a loose fitting handle by clamping the last turn of the spring and squeezing it in a vice or with slip joint pliers. This needs to be done off the metal rod/handle. If the fit is tight you can twist (screw) the handle on. 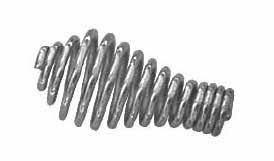 Some customers have slightly rounded or tapered the handle shaft on their stove by grinding or filing the end and then screw the spring handle on.